Hunting by its very nature elicits a primal instinct. None more so than spearfishing, perhaps the most ancient form of hunting. It doesn’t take much gear to get started spearfishing. You can always get away with being as primitive as the ancient natives. Then again, why not take advantage of some modern conveniences? Here are six things to consider when getting into spearfishing. Depending on how much you want to invest will depend on how much dive gear you purchase. The sky really is the limit and like anything else, once you start getting into something, the more equipment it seems you need. All of these items can easily be rented at your local dive shop. Let’s start with the basics: mask, snorkel, fins, weight belt and, depending on the water temperature, a wet suit. In the world of spearfishing, there are purists who free dive and there are those who use scuba gear. The purists, as in other sports, have a way of thumbing their noses at those who tanks. But don’t let this stop you from enjoying spearfishing with a breathing apparatus. It just means you’ll have to purchase more equipment. It may also mean you’ll get a chance to spear a better fish. If you do choose to free dive, you will have to undertake special training in diving deep and holding your breath for extending periods. 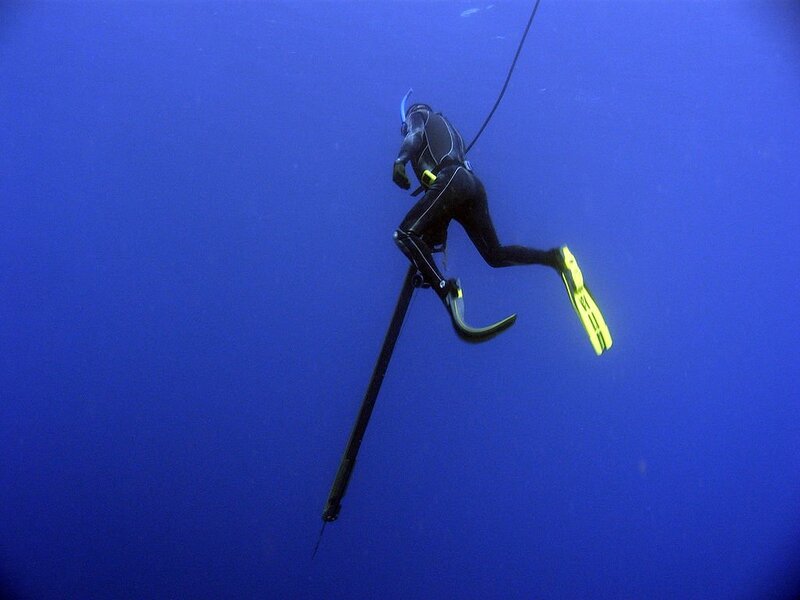 For the spear itself, plenty of divers want to complicate matters with expensive spear guns. In reality, all you truly need is a long spear with an elastic material on the other end. You can buy so-called “Hawaiian sling” type spears at any dive shop. Again, the sling is more to the purists side. Sophisticated tips that are changed out provide a better chance for sticking with the fish. One of the problems with a sling is that if you strike a big fish, it can take off with your spear. For those die-hard spearfishermen, they invest in a float and retrieval system. It’s essentially a long line that’s attached to a float on one end that trails the diver and the other end is attached to the end of the spear, which is removable. In this way, the fish will be attached to the line once it’s hit with the spear and you won’t run the risk of losing it to the deeps. It’s important before you go spearfishing to get acquainted with what you might possibly encounter and the local fish and game regulations in your area. Nothing is worse than shooting something and then realizing that it’s either too small or it’s something you aren’t supposed to take in the first place. Don’t let that be you. Know the rules before you get into the water. That way too you have a better idea of what you’re looking for. The nice thing is, even if you don’t spear any fish, you are still diving. Enjoy the scenario while you’re down there and realize you are carrying out an evolutionary practice of returning to the sea from which we came. Diving deep through a field of kelp or a coral rock face with fish swimming by is truly a magical experience and one that makes spearfishing an addictive sport.